Picture - The only Canadian built Avro Lincoln. 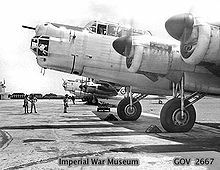 The Avro Type 694, better known as the Avro Lincoln, was a British four-engined heavy bomber, which first flew on 9 June 1944. Developed from the Avro Lancaster, the first Lincoln variants were known initially as the Lancaster IV and V, but were renamed Lincoln I and II. It was the last piston-engined bomber used by the Royal Air Force. The Lincoln became operational in August 1945, too late to see action in the Second World War. 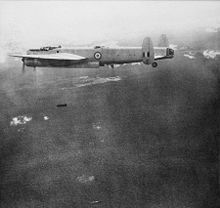 It was assigned to units of Tiger Force, a British Commonwealth heavy bomber force, intended to take part in Allied operations against the Japanese mainland. However, the Lincoln did see action with the RAF during the 1950s, in the Mau Mau Uprising in Kenya and with the RAF and RAAF during the Malayan Emergency. In all 604 Lincolns were built. The type also saw significant service with the Royal Australian Air Force (RAAF) and Fuerza A�rea Argentina (Argentine Air Force), as well as some civil aviation usage. The Avro Lincoln was Roy Chadwick's development of the Lancaster, built to the Air Ministry Specification B.14/43, having a longer span, higher aspect ratio (10.30 compared with 8.02) wings with two-stage supercharged Rolls-Royce Merlin 85 engines, and a bigger fuselage with increased fuel and bomb loads. As a result, the Lincoln had a higher operational ceiling and longer range than the Lancaster. 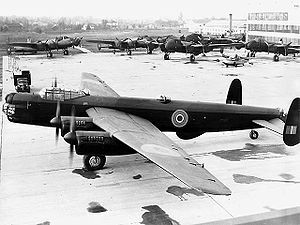 The prototype Lancaster IV (Lincoln I) was assembled by Avro's experimental flight department at Manchester's Ringway Airport and made its maiden flight from there on 9 June 1944. The Lancaster V/Lincoln II differed mainly in that it was fitted with Merlin 68A engines. Before the Lincoln was developed, the Australian government intended that its Department of Aircraft Production (DAP), later known as the Government Aircraft Factory (GAF) would build the Lancaster Mk III. Instead, a variant of the Lincoln I, renamed Mk 30 was built between 1946 and 1949, the largest aircraft ever built in Australia. Orders for 85 Mk 30 Lincolns were placed by the RAAF (which designated the type A-73), although only 73 were ever built. The first five Australian examples (A73-1 to A73-5), were assembled from British-made components. A73-1 made its debut flight on 17 March 1946 and the first entirely Australian-built Lincoln, A73-6, was delivered in November 1946. The Mk 30 initially featured four Merlin 85 engines, but was later equipped with a combination of two outboard Merlin 66s and two inboard Merlin 85s. The later Lincoln Mk 30A featured four Merlin 102s. The RAAF heavily modified some Mk 30 aircraft for anti-submarine warfare during the 1950s, re-designating them Mk 31. These examples had a 6 ft 6 in (1.98 m) longer nose to house acoustic submarine detection gear and its operator, larger fuel tanks to give 13 hours endurance, and modifying the bomb bay to accept torpedoes. The Mk 31 was particularly difficult to land at night, as the bomber used a tailwheel and the long nose obstructed the pilot's view of the runway. 18 aircraft were remanufactured to this standard in 1952, gaining new serial numbers. No. 75 (New Zealand) Squadron RAF began re-equipping with Lincolns at RAF Spilsby during August 1945. However, 75 (NZ) Sqn received just three aircraft before VJ Day. One Lincoln B Mk XV pattern aircraft was also completed in Canada by Victory Aircraft with an order for six RCAF variants cancelled when hostilities ended. Along with two additional (Mk I and Mk II) aircraft on loan from the RAF, the type was briefly evaluated postwar by the RCAF. In the postwar Royal Air Force, the Lincoln equipped many bomber squadrons. Nearly 600 Lincolns were built to equip 29 RAF squadrons, mainly based in the United Kingdom. They were partially replaced by 88 Boeing Washingtons, on loan from the USAF, which had longer range and could reach targets inside the Iron Curtain. Picture - Lineup of the first operation of No. 1 Squadron, Royal Australian Air Force at RAF Tengah, Singapore, August 1950. The Lincoln served with the Fuerza Aerea Argentina from 1947: 30 aircraft were acquired (together with 15 Lancasters), giving Argentina the most powerful bombing force in South America. 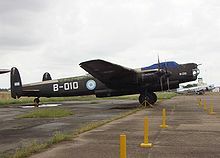 RAF Lincolns were also used in combat during the 1950s, in Kenya against the Mau-Mau, and RAF and RAAF examples served in Malaya during the Malayan Emergency, against insurgents aligned to the Malayan Communist Party. The Argentine aircraft were used in bombing missions against rebels during the attempted military coup of September 1951 and by both the government and rebel forces during the 1955 Revolucix�n Libertadora coup that deposed Juan Perx�n. Lincolns were also used to drop supplies in support of Argentinean operations in the Antarctic. On 12 March 1953, a RAF Lincoln (RF531 "C") of Central Gunnery School was shot down 20 mi (32 km) NE of Lx�neburg, Germany by a Soviet MiG-15 as it flew to Berlin on a training flight, resulting in the deaths of the seven crew members. As the RAF Lincolns became unserviceable due to wear and tear they were replaced by Shackletons. The Lincolns of Bomber Command were phased out from the mid-1950s, and were completely replaced by jet bombers by 1963. The last Lincolns in RAF service were five operated by No. 151 Squadron, Signals Command, at RAF Watton, Norfolk, which were finally retired on 12 March 1963. The RAAF Lincolns were retired in 1961, while Argentina continued to use its examples until 1967. Lincolns were frequently employed as testbeds in new jet engine development. RF403, RE339/G and SX972 flew with a pair of Armstrong Siddeley Python turboprops outboard in place of the Merlins, and was used for the ballistic casing drop-test programme for the Blue Danube atomic weapon. SX972 was further modified to fly with a pair of Bristol Proteus turboprops. RA716/G had a similarly placed pair of Bristol Theseus turboprops and later also flew with Rolls-Royce Avon turbojets replacing the pair of turboprops. RF533 kept its Merlins but had a Napier Naiad turboprop in the nose. It later flew, bearing the civilian "Class B" test registration G-37-1, with a similarly placed Rolls-Royce Tyne which it displayed at the 1956 Society of British Aircraft Constructors (SBAC) show, making a low level flypast on just the nose Tyne, the four Merlins being shut down and propellors feathered.SX973 had a Napier Nomad diesel turbo-compound installed in a similar nose-mounted installation. RA643 flew with a Bristol Phoebus turbojet in the bomb bay, and SX971 had an afterburning Rolls-Royce Derwent mounted ventrally. One Argentine example was converted to a Lincolnian by Avro at Langar. Four Lincolnian conversions by Field Aircraft Services for use as meat haulers in Paraguay were not delivered and subsequently scrapped. Anti-submarine/maritime reconnaissance version for the RAAF. Lincoln II B-004 On display as B-010 at the National Museum of Aeronautics, Buenos Aires, Argentina. Lincoln II B-016 A gate guardian at the Villa Reynolds airbase, San Luis Province, Argentina Lincoln II RF342 In storage for future restoration at the Australian National Aviation Museum, Melbourne, Australia. Lincoln II RF398 On display at the Royal Air Force Museum Cosford, United Kingdom. Guns: 2 x� .50 in (12.7 mm) M2 Browning machine guns in nose and tail turrets, and dorsal turret with either twin .50 in machine guns or twin 20 mm Hispano cannon. Bombs: Up to 14,000 lb (6,400 kg) of bombs (normal maximum). Exceptionally one 22,000 lb (10,000 kg) DP bomb. Marino, Atilo, Vladimiro Celleto and Javier Mosquera. "Argentina's 'Heavies': Avro Lancaster, Lincoln and Lancastrian in Military Service: Part One." Air Enthusiast, No. 95, September/October 2001, pp. 64-70. Stamford, UK. Key Publishing. ISSN 0143-5450. Marino, Atilo, Vladimiro Celleto and Javier Mosquera. "Argentina's 'Heavies': Avro Lancaster, Lincoln and Lancastrian in Military Service: Part Two." Air Enthusiast, No. 97, January/February 2002, pp. 36-43. Stamford, UK. Key Publishing. ISSN 0143-5450. Avro Lincoln Pictures and Avro Lincoln for Sale.